To flourish a super efficient business – whether offline or online, it is very imperative to have a good sync with the customer base. 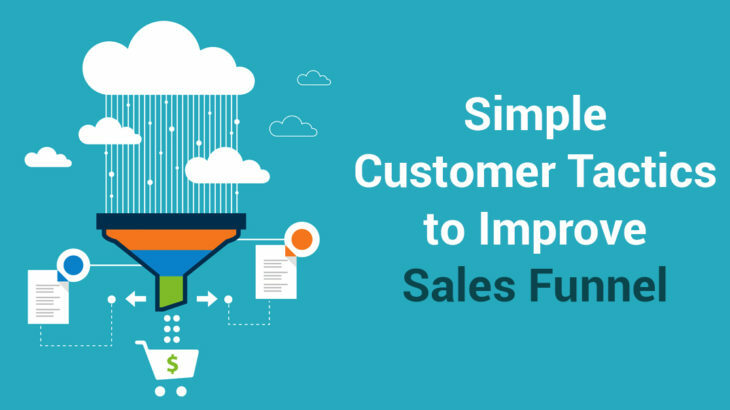 With such fierce competition and innovation in online marketing, almost every company is coming up with ingenious ideas to put up the best face amongest others.How to make customer retention tactics to improve sales funnel? And in such grave scenario, losing your customers to others will certainly be a big blow to the business. Customers are volatile and move to that one direction where they find awesomeness, creativity and efforts lined up one after another. Thus, coming up with new ideas and tasks becomes comprehensibly vital. To make you well versed with your customer belt and to retain them for enhancing your sales funnel, a compiled list of some best sorted tactics is presented. Have a look to make your way for awarding best services, platform and sustaining the customers for long. Going by these principles, not even a single customer will fall down your platter. Here goes. It’s very well said that ‘the art of communication is the language of leadership’. Abiding by the same words, more the interaction, better the results. It’s duly necessary to build a healthy response mechanism to retain customers for a long time. The foremost step is to set up constructive resources to take care of the customers’ responses to a certain thing. No matter what the frequency may be, the responses should be delivered at the earliest and within stipulated time frame. This not only ensures speedy transmission of information but also demonstrates the company’s interest in its customer unit. This definitely goes a long way in warranting that customers are made for life. One of the most enthralling ways to do this is by being duly active on social media like twitter, Facebook etc. Almost every other company is using this as a marketing tool to trigger their customer population. Furthermore, it keeps the interest levels of the customers appreciably high and what better than this in today’s era? The companies can also come up with various latest options like ‘Live chat’ to showcase their new product or service and simultaneously taking reviews from the public. Such measures will safeguard a stellar rise in customer engagement and nothing will be left behind. Every other person likes to feel privileged, every now and then. Plus, this one very trait of people comes handy in sustaining a good amount of customers. By incorporating special perks to the evergreen customers, the companies can profit hugely- both economically and psychologically. It is considered as an astute measure to encourage the loyal customers. The customers who have been availing the company’s services from a very long time should be indulged in such special privileges clubs and offers. This not only heartens them but also keeps their interest levels in the company, at peak. Establish a VIP page for such customers and bring out discounts, offers and special services for them. Also maintain a tracking mechanism to check how their habits changed after being a part of the elite VIP club. To further rouse them, send them emails stating the essence of such offers and how important and esteemed they are to the company. Dignified flattery never goes wasted and this one will obviously be right on the point. In addition, these privileged customers will yearn for more such benefits and will surely stick to the company for exciting future prospects. Thereby, the ball will surely be in your court. Customers will not even budge an inch if perpetual delivery of awesome content is there. This is perhaps the simplest yet the best way to retain customers for ever. A firm can surely gain supremacy over other by inculcating this one feature. One should completely focus on more actionable posts and knowledge delivering parameters. Putting up the best content on internet undoubtedly gives your customers a reason to return and explore more. Furthermore, keep updating the posts and add freshly prepared matter on to the site. This not only gives them a glimpse of your authenticity but also take you a notch high than others. One should also take reviews from the customers on the type of products or services they wish to avail in future or how will they like the future posts to be? Doing this constructs a sort of vigour in the audience and they will never view your work as tedious. Or how can they, when you’re constantly coming up with brand new ideas every now and then. By giving them more insight into your work and indulging even the minutest details in your work, evades all forms of monotony. A happy customer is the one who takes interest in your work, looks forward to your posts and admires your creativity. And a happy customer is a forever customer! Someone rightly pointed out, ‘Customer complaints are the schoolbooks from which we learn’. A thorough evaluation of a certain customer complaint gives you that extra edge you always needed. It’s best to turn those complaints into subtle compliments. Dealing with their grievances awards you a chance of serving them better, thus putting up with their ups as well as downs. Moreover, such complaints plausibly open the doors for better communication and wider avenues. Plus, while dealing with the customer, make sure you sound convincing every moment. This one thing has the power to build or ruin your reputation, so better take it to constructive causes. There is also one stupendous way to deal with their complaints and that is by wearing their shoes. In better words, try placing yourself in the same position and then analyze how to deal with the same picture. Bring forth your best grievance redressal system and act on their issue at the earliest. Such satisfied customers will then keep coming back since they are served in such an efficient manner. In this unanticipated world of fast communication, social media and likewise can easily give opportunities to your customers to degrade your name in public. Thus, an annoyed customer can surely cost you big. Thereby, empathy and concern will undoubtedly take you a long way in retaining your customers for life. A complacent customer will never leave you side, never ever. Surveys can definitely win your customers over as they are duly challenging and demanding. The primary step here is to prepare a list of questions you always wanted to ask your customers in order to serve them better. What exactly do you like in us? Do you mind if we switch from this to that? How often do you want the discount offers to flourish? Do you think we need to add this section as well? Asking such basic questions to the customers, once in a while, never let their interest to die down. Moreover, it entertains them and is a clear indication of your never dying interest in them. This action also yields two things, the first being receiving the answers from the customers, working on them and improvising on certain areas fruitfully. The second is winning your customers by working on their advice and influence. Conducting surveys to know your pain points is also tremendously beneficial. You will then be aware of your leeward side and will possibly work in the apt direction to diminish them completely. This also gives you a clear idea of what exactly does the customer need and how to go about it. Surveys also ensure transparency in your work and brushes out the guesswork from your job. Isn’t this an unrivalled way to keep the customer percentage incredibly high? Follow or rather stalk your customers on social media and indulge in their needs and wants. In this fast paced world where people do not like much to speak on phone, this one publicity door is your best option. Social media interaction is crisp, interesting and viable; thus considered as the most preferred option by the customers. Maintain a track of their feedback, doubts and complaints on social media and use them as tool to improve your work. For instance, if a customer really loved your work, he will assuredly praise it on social media, thus winning you more customers. Plus, you can always launch a new product, announce the latest blog and numerous other activities on your social media handle. By doing this, allow yourself to be entirely flexible in your approach. As mentioned earlier, with the latest trending options available on social media these days, one can reach to the widest set of people. One such option is to conduct a ‘Live chat’ to simultaneously interact with the interested people. Furthermore, surveys are best done on social media. People take heavy amusement in viewing and rating your work, if you have an attractive social media handle. Chat with them, take timely feedbacks and keep uploading thrilling stuff related to your work, on those handles. Make sure to respond them collectively and create groups in order to boost your trade. Enthusing your customers with their favourite thing will unquestionably work in your favour. So, the techniques covered above will make sure you do not miss out on even a single customer because customers are your prized asset. Pick and execute all these to have the best customer population without trading them into monotony and boredom. Customers keep us busy, provides us work and at the end of the day they are to be served with utmost sincerity and zeal. The above mentioned tactics are 100% practical and will govern your customer base with higher retention. Manage E-commerce Customer engagement, customer retention tactics, E-commerce customer experience. permalink.